1. My summer favourites! This lip scrub is my saviour, come summer or winter as it sorts out my chapped lips in no time. And if you read this blog for a while, you will know I'm obsessed with everything and anything Urban Decay and this has to be my favourite concealer. That reminds me, need to reorder it as I'm running out. 2. Friday night was surprisingly sunny and I was wearing my new slip dress which I love as it is so lightweight and fresh. I can definitely see myself wearing it on hotter days (which I hope are still yet to come). 3. Because flowers make everything better, even a horrible rainy Saturday. 4. If you haven't been to Dinerama in Shoreditch, London yet do yourself a favour and go check it out. I had the most amazing Pulled Duck Bun with fries from Duck 'N Roll and I'm definitely going back to try out everything else the different stands have to offer. Lookout for a review coming soon! 5. And finally, what I wore for my day out yesterday with the girls. Highlight of the outfit has to be this stunning Banana Republic Red Leather Ring Bag* which sadly is now sold out but you can check out similar items on sale here. 6. If going to their blogging event last month wasn't enough, I got the chance to go all out at Banana Republic. Their signature Sloan-Fit Trousers* are now the highlight of my wardrobe and quite frankly the best pair I own. Think comfy, stretchy and pretty much all-round amazing; I am a fan and will definitely be going back for more. 7. Thank goodness I booked my holiday prior to the Brexit! Sadly though I didn't get the change to buy Euros beforehand and I am now regretting massively; have you seen the massive GBP drop against the € and $? Scary stuff. Having said that, I am very much looking forward to sitting on the beach and doing nothing for almost 10 days! Algarve, here I come! 8. We've got summer coming up, my holiday (refer to point above) and my wedding! Hence, to get in shape I've been trying to go to the gym 2-3 times a week and it's been working out really well so far. I feel so much more confident and I can definitely see a small yet already noticeable transformation to some parts of my body. 9. The lipstick I cannot put down (no matter how drying it is). I vowed to give up on getting one of these after 3 failed attempts, but when I won the competition held by the lovely Veebz Boo, I could hardly say no. Major love for the shade Posie K! 10. I bought this gorgeous skirt back in February form Stradivarius so you can only imagine how happy I was to finally take it out for a spin! Pleats were hot in Spring but given Summer is still playing us around, I will be wearing it on repeat. 11. BEACH bags! Seen my post where I talk about the must have summer bags this year? Lust over all the pretty designs you too will want to add to your wishlist here. 12. View from the London City Airport bridge which is like 3 minutes away from my home. Sleeping and waking up to the sounds of air-planes, is there anything better? 13. Nautical Stripes and a bright pop of colour. Seen my latest outfit post? Check it out here, it's a good one! 14. Another pair of pants from Banana Republic, this time in their Avery-Fit Trousers* and best yet, this is now on sale. 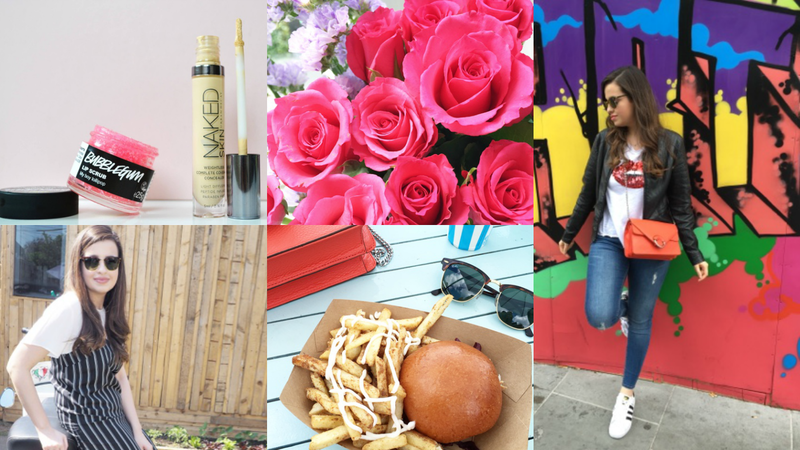 I'm all about #YourLifeStyled lately. Tell me, what have you been up to lately? Got any holidays planned? Follow me on Instagram here if you haven't yet! And make sure to leave your handles below so I can check you out too! Love the pics, amazing post! Yes, I have a summer holiday planned! And I am so excited. But first comes the dreaded move. I love your feed girl <3 that burger looks insane! I'm loving your Banana Republic pieces...and I can see why you cannot put that lipstick down, the shade looks gorgeous on you! I can't believe you'll be off for holiday for 10 days, have fun girlie! And I adore the way you do you IG roundups, at least you explained each picture unlike some who just smack the pictures into one post and not saying anything. Have fun! I hope your trip is wonderful! Looks like you've had a nice week! I love the post hun! That lipstick is to die for, I need it in my life now OHMYGOD!!! I love all the photos, the burger looks great! Arrasou nas imagens amei, tenha uma semana abençoada. Love these round ups! That Banana Republic bag is gorgeous! No holidays booked unfortunately, have fun in the Algarve! Yum, that pulled duck bun with the fries looks sooo delicious! Posie K looks like it was made for you. It's seriously so pretty! great posts. i am also going to vocation. so its helpful. Great IG pics! Have a fabulous time in Algarve Pam! Have a nice week my lovely! Woah, love your instagram feed. And Posie K looks lovely on you, indeed. I love your IG pics dear and I'm happy to be following you there. It seems like you have some pretty exciting times coming ahead!! By the way, all your outfits are gorgeous! Instagram is my obsession! Aha, I know, I've been posting quite religiously for a while now. Love your feed Pam! LOVE Urban Decay, and Posie K looks fabulous on you. Can't wait to hear about your upcoming vacation! Great roundup, I love that Lush lip scrub so much!! The Kylie Jenner Lipstick looks very good. I need that Kylie Jenner Lippie! 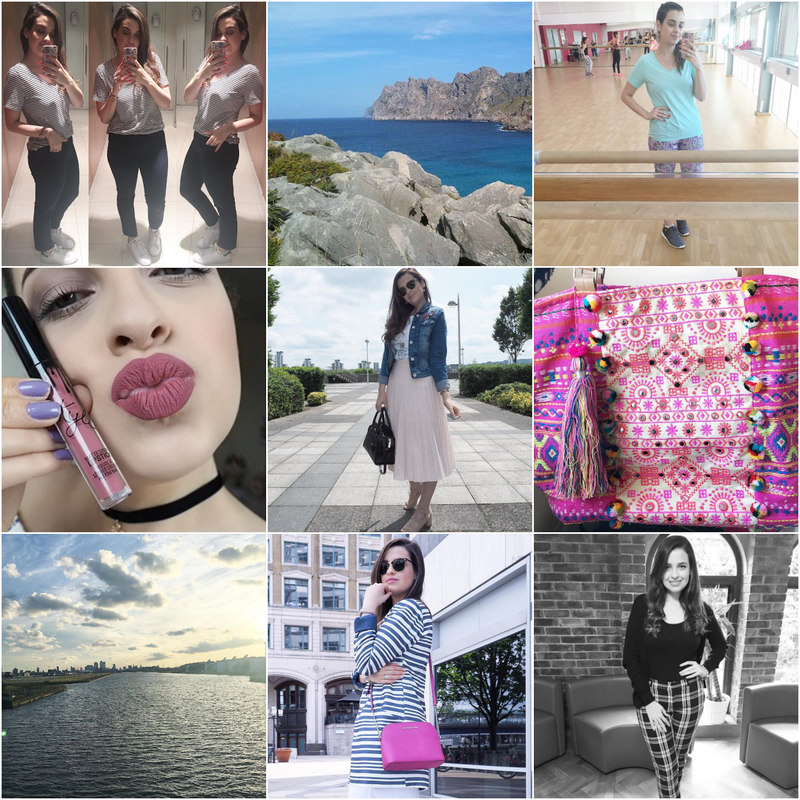 What I LOVE about Instagram is that it really is a little snapshot into someones life! Love scrolling my feed. I need to get my hand s on the Kylie lip kits! Such a wonderful bag and news about your wedding! And yes, buying euros prior to Brexit would have been so good. The sterling dropped in a horrible way and it's such a chaotic situation now. But at least you will relax and go to a nice beach, and also, I have to say that I loved this round up - I am not on Instagram and I liked to see the news! My favorite flowers and yes, even a rainy Sunday is rescued by them! Hugs and a nice "rest" of the week!